I actually made 3 things for E before this one but this being Selfish Sewing Week and all, I figured I would do mine first. That, and it was easier to get last minute pictures of myself than E. Not good pictures, mind you, but pictures. Pattern: Jalie 3352. I’ve made it once before and knew there would be another one in my future. With short sleeves this time. Still in love with the pattern. It’s just the best combination of comfortable but not sloppy. 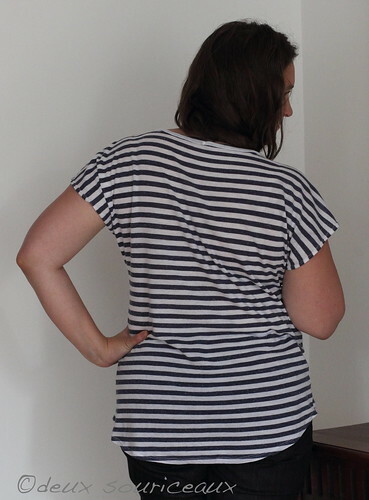 Fabric: Striped jersey from Imaginegnats (1 yard). I have no clue what the fabric content is. This fabric feels almost like a very lightweight sweater knit. Not very stable, a little more loosely knit than a regular T-shirt knit. Oh, and that sucker biased like fiend after a wash. I suspect the yarn it was knit with isn’t balanced. It was a bit difficult to work with, to be honest. Like a sweater knit. But check out my stripe matching! It goes wonky at the underarm but that’s because it wasn’t possible to match them up. Not the same number of stripes on front and back. I don’t know if it’s a problem with the pattern (not likely) or a problem with the cutting out (most likely). See, I had juuuuust enough fabric to cut out that top but I may have stretched it a bit lengthwise to get that back pattern piece to fit. So the back may be shorter than the pattern intended. Ooops. And now. Think I can get pictures of the girlie with her new clothes this week? That looks comfortable! 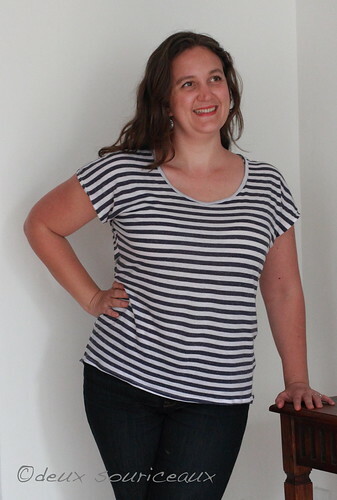 I’ve had the same thing happen with my stripes on knits… I usually start lining them up at the underarm and just cut any extra off at the hem. Haha, true! And most people who don’t sew don’t notice whether the stripes match or not anyway. You should see me complain to my husband when I see something in a store and the plaids or stripes don’t match up. I’m fine with it if it’s an inexpensive item but if I’m expected to fork over 100$ for a blouse, that plaid had better match up!